The Scoop: The Somalis will outnumber the Americans 2:1 to 3:1. Additionally they will continuously “hot insert”, while the US side will insert every 15 min. To balance this, the Americans will have limited tank support and medic rules, allowing them to be “healed” by a medic up to three times before they are required to return to the dead zone. Ø The Lost Convoy – The Americans will attempt to move from base to base (they don’t find out their next objective until they complete their last one) and either exit the field or reinforce the Alamo. Ø The Alamo – the Somalis will attempt to overrun the Alamo (different for each game; Highlands Castle, Tippmann Towers, or Sin City). Ø Blackhawk Super Six-Four – at some time between 20-60 min. into the game, another Blackhawk will go down somewhere on the field. 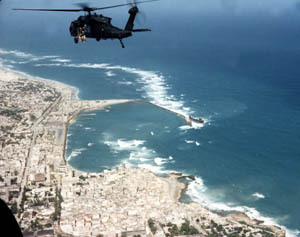 The American’s goal is to rescue the downed airmen and destroy the ‘copter. The Somalis goal is to take and hold the helicopter. Other Details: Task Force Ranger will be selected out of pre-registered players only! All walk-ons will be Clan Habr Gidr. Teams consisting of 10 or more pre-registered players will be selected from those who to fill out an application below, as well as persons interested in leading one of the side.